This is for non-members who are registering for the conference after 9/20/14. The late registration fee and non-member fee are included in the base price. Your total conference registration cost will be calculated based on your selections during the registration process. For conference staff, speakers or Board Members who have a conference registration agreement in their speaker contract. "Living on the Edge in EMS Education"
You must be logged in as a member to view the member registration options to the left. 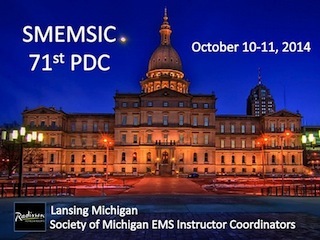 Welcome to the SMEMSIC Fall 2014 Conference registration page. If you have not already done so, please Click Here to view session descriptions before completing your registration. During registration, you will need to select the SMEMSIC Region of the State you live or work in. Click Here to view a SMEMSIC region map if you are unsure of the region to select. If you are a SMEMSIC member, please be sure to log in before completing your registration. You will not be able to register at the member reduced rates unless you are signed in as a member. For additional information on the conference, you can click here to go to our conference information page.